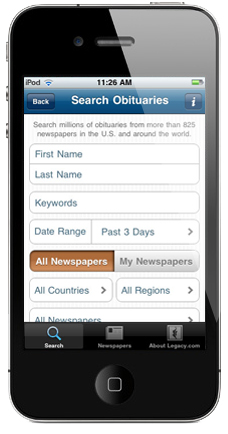 Great news for iPhone users: you can now use Legacy.com on the go with our brand new ObitFinder™ app. The app is easy to use and puts Legacy.com’s database of millions of obituaries and Guest Books at your fingertips – anywhere, any time. You’ll have access to our full network of newspapers (more than 800 newspapers in the US, Canada, UK, Ireland, Australia & New Zealand) and funeral homes. You can search an individual newspaper’s listings, search all newspapers, or assemble and save a list of favorite newspapers to search. Look for a specific obituary or browse your local newspaper’s obituaries, updated each morning. Once you locate the obituary you’re looking for, you can sign the Guest Book, send flowers, get funeral home maps and directions, and much more. Android users, we haven’t forgotten you! The Android version will follow, so watch for our announcement. We hope our ObitFinder™ app will help enhance your smartphone use and make it easier to locate the obituaries that matter to you. If you have any questions about downloading or using the app, email us at info@legacy.com and our customer service team will be happy to help. This entry was posted in New from Legacy.com and tagged iPhone, Newspapers. Bookmark the permalink.